I'll tread lightly upon this subject of 3D for realizing there are experts that know it chapter/verse, and so humbly invite same to expand upon or correct data gathered here. Just understand that 3D represents a noble tradition of screw-ups and breakdowns, my own in respectful observance of that. I embark upon multi-posts about the process, mindful not to exceed an initial three (more will follow later) as we’ve all known fatigue too much 3D can inflict. Like a lot (most?) of you, I’ve never seen it decently presented. By that I mean with two projectors side-by-side running in perfect synchronization. I'm for dealing out modern third dimensions this trip. 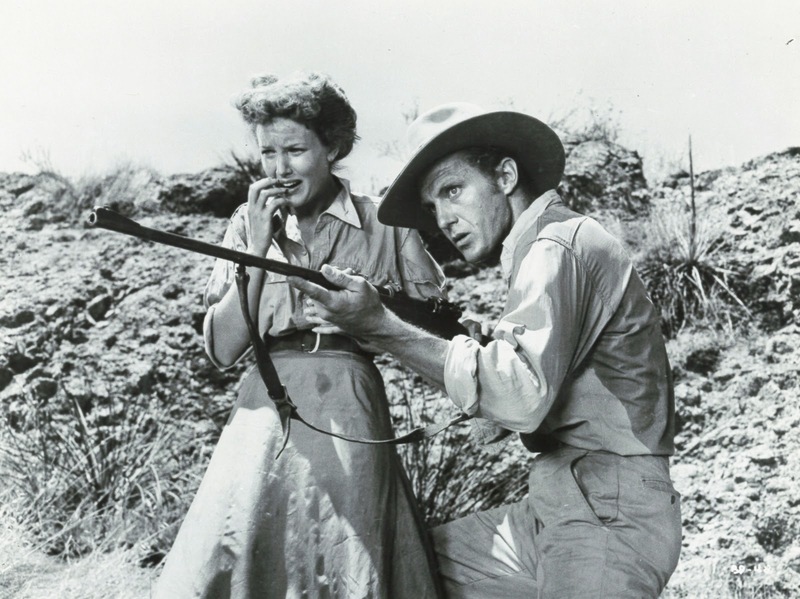 The only sampling I’ve seen anyhow was a handful of ear-jangling IMAX shorts about jungle safaris. What I’m for exploring is so-called primitive 3D that excited patrons during 1953 and much of ’54. I was born during the boom and feel closer to it for that. The Egyptian Theatre in Hollywood has run two depth festivals with practically everything extant on view. A friend flew cross-country to see them while headache fears kept me home. An experienced operator will assure you that no pain comes of watching 3D provided those in the booth know what they’re doing. As this was/is/always will be a species rare, there’s little wonder the 50’s flame burned off quickly. Moviegoing travels brought me twice to House Of Wax on single-strip reissues (1972 and 1983), both botched. 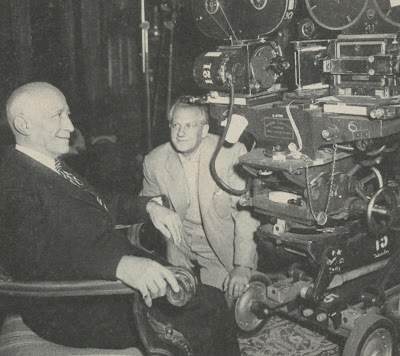 Other than that, there was Revenge Of The Creature with 16mm reds and greens having faded, thus killing the 3D effect, and more recently the challenge of DVD-delivered Spooks, with The Three Stooges. 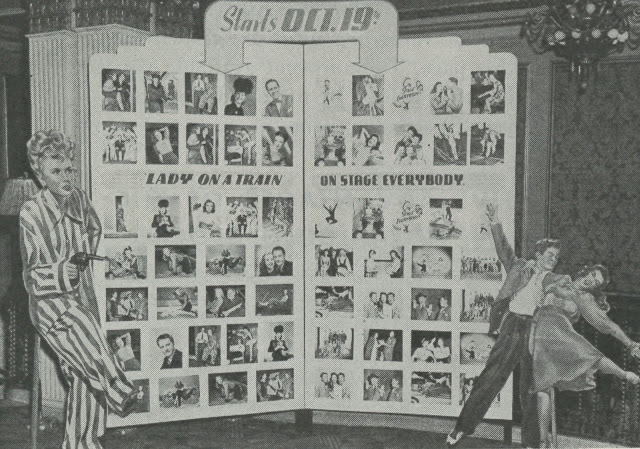 Yet I’m rarin’ to go for 3D after boning up on 50’s showman efforts to get a rope ‘round a novelty most of them figured for the flash in the pan it turned out to be. 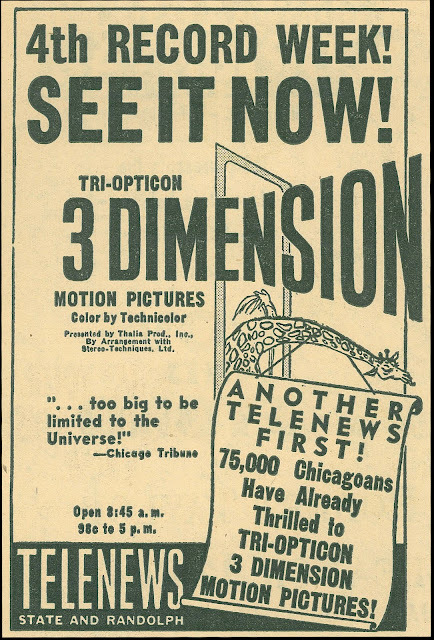 Old timers in the business said 3D reminded them of the mess that was Vitaphone, and here they were twenty-five years later reliving sync-up nightmares. Each to a man knew what a minefield that could be. There was always option of letting the craze pass, but what of lines and epic grosses your opposition’s fielding down the street? 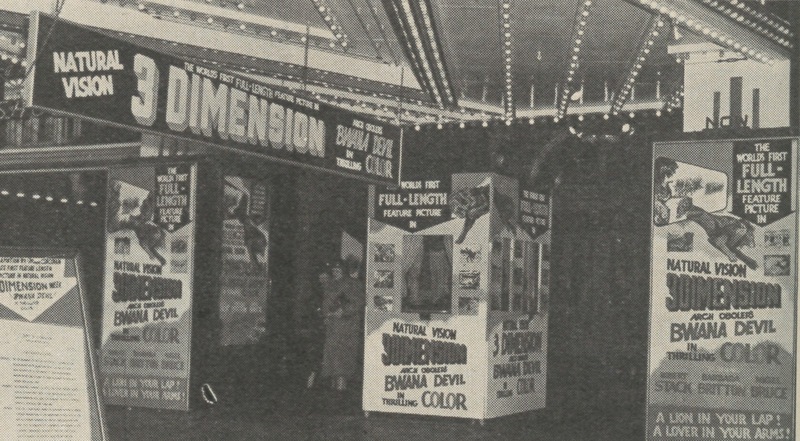 Exhibitors sought elixir to bring people back into theatres. Hit movies continued declining in number as solid attractions on TV carved inroads. 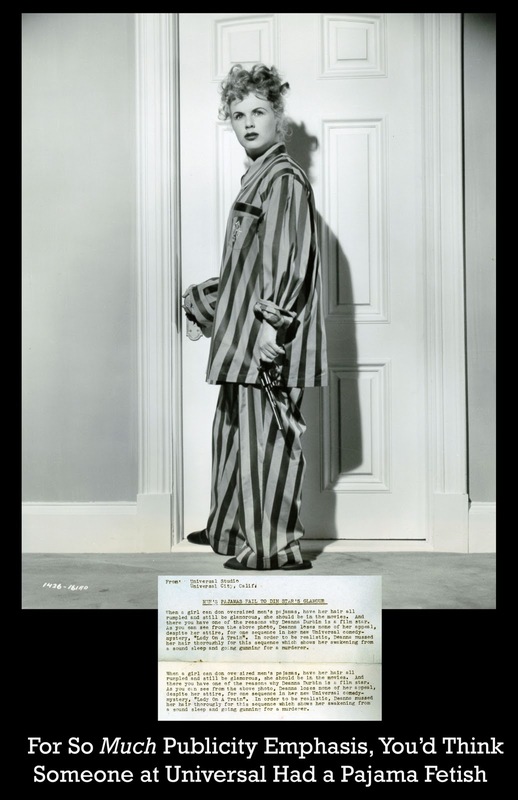 Wouldn't you elect to stay home and watch Lucy or maybe Martin and Lewis doing the Colgate Comedy Hour over going out and paying admission for a commonplace feature? By late 1952, most were voting the tube. Whoring out to a gimmick was desperation’s last resort for an industry down on canvass and taking the count. Independent producer Arch Oboler was an experimenter from radio who guessed 3D might click at feature-length. Maybe others considered it before, but he was first to throw dice with monies borrowed and bookings scavenged where management would gamble with an unsure thing. 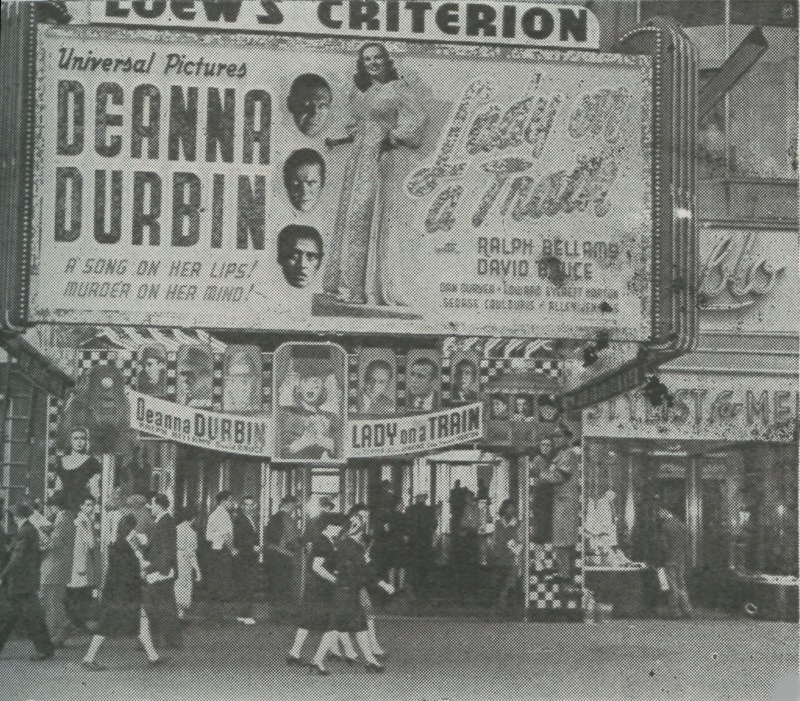 Two Paramount theatres in Hollywood were Oboler's testing Ground Zero. For four weeks they would play Bwana Devil to what observers called unprecedented business. They'd have kept it longer but for prior booking commitments. This was December 1952. Just as industry watchers wondered if The Jazz Singer might be a fluke back in 1927, so too did studios flinch over dives into 3D. Another independent with spring in his step was Sol Lesser, always quick to move in on someone else’s good thing. A British developer leased him rights to a process called Tri-Optican and a handful of shorts utilizing its depth (including a documentary, cartoon, ballet, and an abstract film, according to Boxoffice). Some said the latter looked better than Oboler’s Natural Vision. Lesser’s Tri-Opticon was America debuted at Chicago’s Tele-News Theatre on Christmas Day 1952. $30,000 was rung up for a week that would normally average four to five G’s. Santa Claus was finally back in town to call on besieged exhibitors. 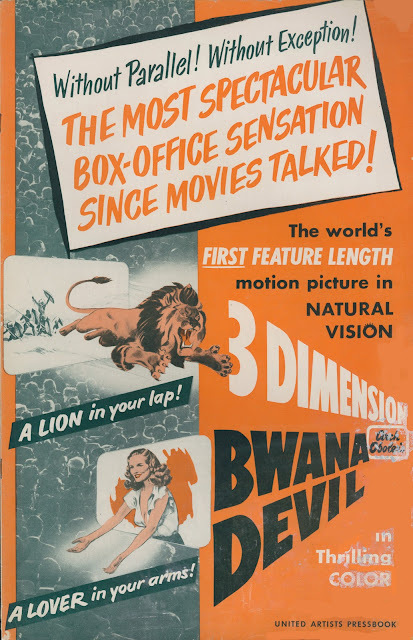 Seizing initiative as they had with talkies, Warner Bros. announced shooting would begin January 15, 1953 on Wax Works in Natural Vision 3-D. They understood this was a race for what Jack Warner called a fast dollar at the box office. 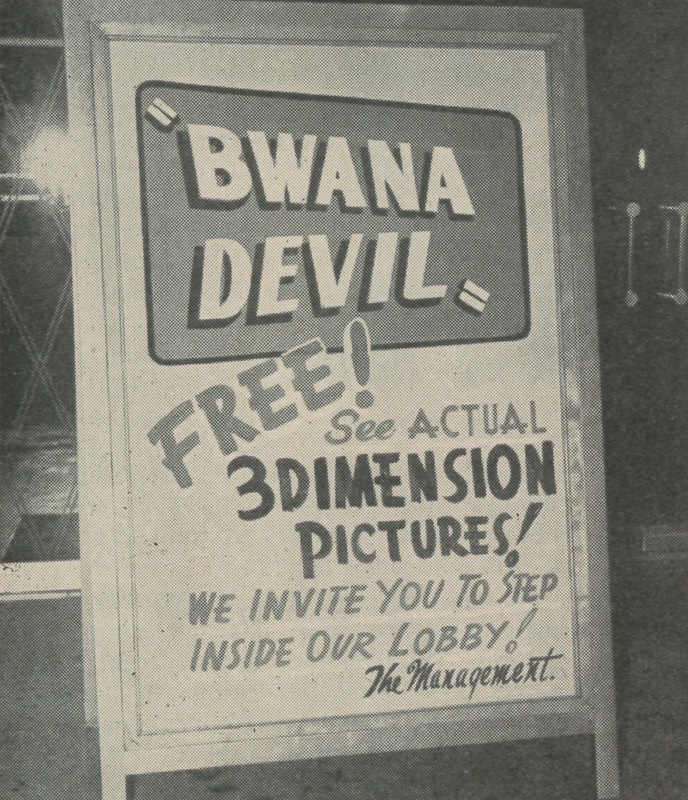 Directors of the Theatre Owners of America exhibitors group convened in January 1953 to discuss future possibilities of 3-D, and provided a print could be secured, to inspect Bwana Devil as well. Sol Lesser was meanwhile delivering equipment and accessory packages to theatres booked for Tri-Opticon. 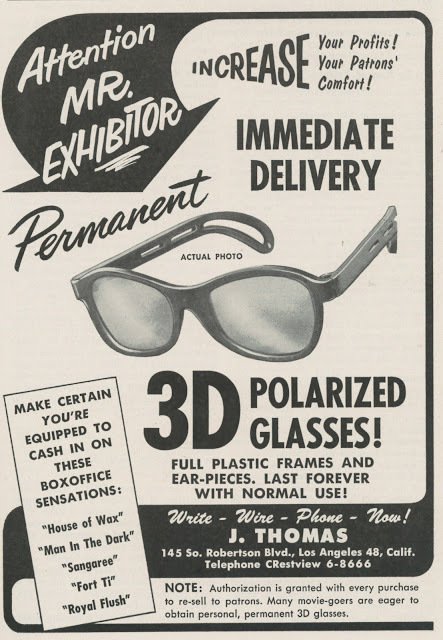 They’d need a “metalized” screen, a coupling device for interlocking projectors, and Polaroid glasses, these being reusable provided they were sterilized after each show. Harrison’s Reports saw those glasses as 3-D’s main obstacle to wide acceptance even as crowds braved snowstorms to break house records at northeastern theatres where Bwana Devil was playing. Every Hollywood studio was knee-deep in experimentation to develop their own “dimensional” format. 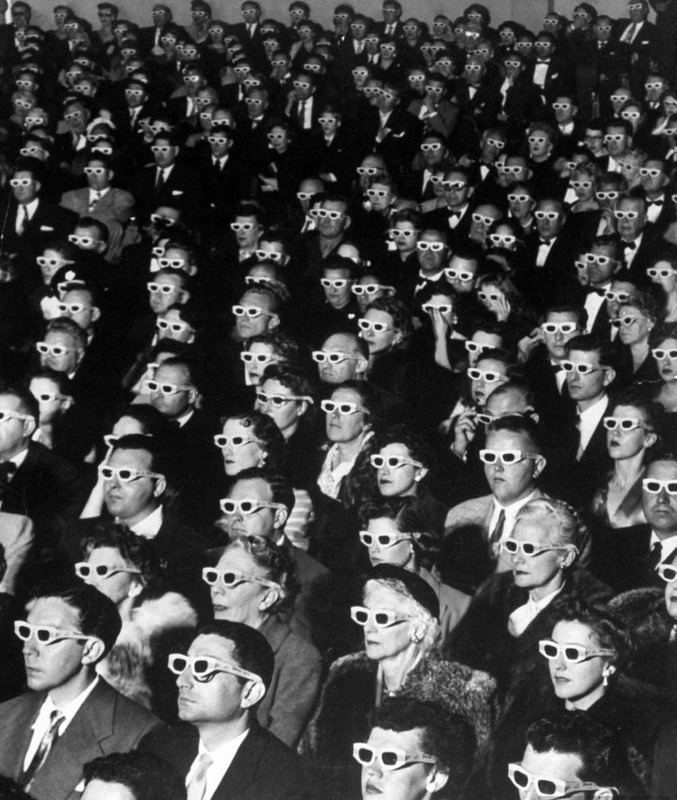 Mid-January saw Fox announcing what they called Anamorphisis, the large-screen French process which offers a three-dimensional effect. The Robe was slated to be the company’s first in Anamorphisis. Paramount’s Adolph Zukor promised 3-D that would not require glasses (we’re still waiting for that). Sol Lesser was sufficiently buttressed by Tri-Opticom’s success to foresee twelve complete 3-D programs per year under his auspices. 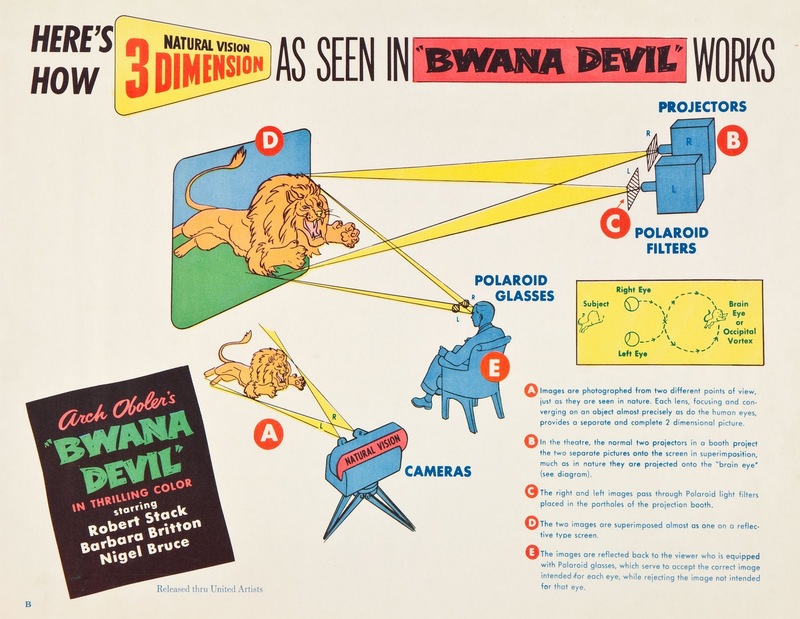 Arch Oboler meanwhile fielded offers from distributors eager to buy him out of Bwana Devil. He'd be in New York negotiating with United Artists for a sale of what was at that moment the industry’s hottest picture property. Part Two on 3D is HERE. 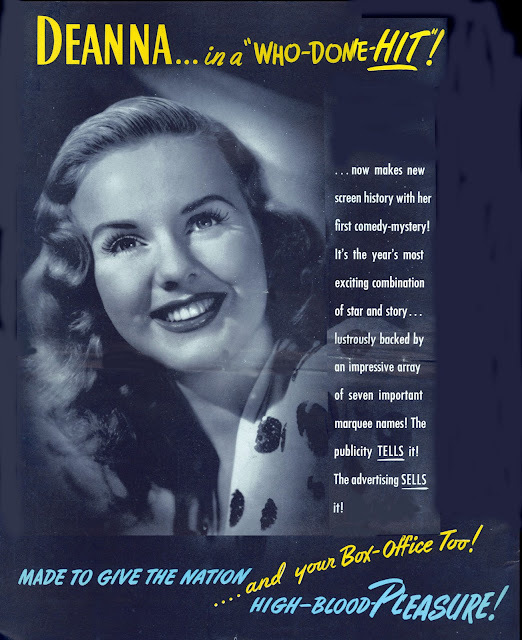 Got an e-mail from The Film Noir Foundation promoting their Frisco/Castro Theatre "Christmas Noir" show, which this year featured a Deanna Durbin two-fer, Lady On A Train and Christmas Holiday. The latter's title misleads --- it's a downer equivalent to coal in stockings, but Lady On A Train pleases for lightly-applied Noir, a night club set lavishly appointed, and a not-so-mysterious, but still engaging, murder mystery. 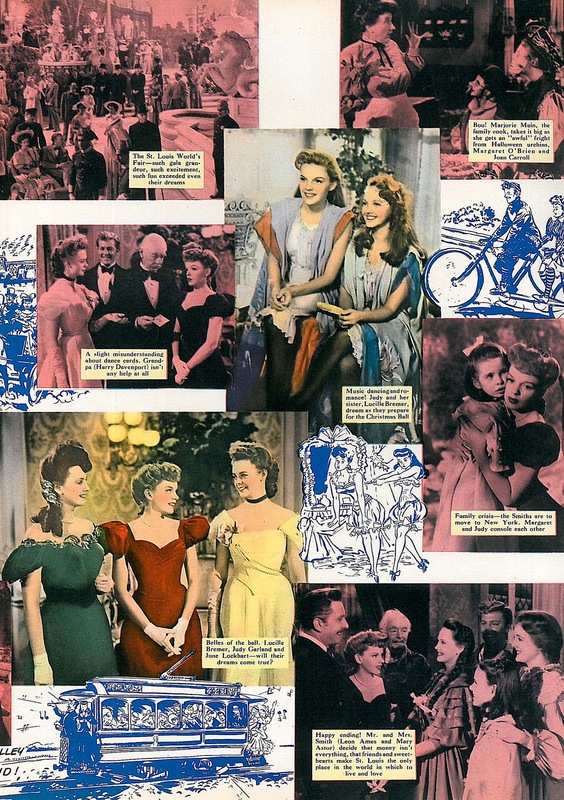 It's Universal-sandwiched (1945) between Phantom Lady and The Killers, of a piece with both, and gorgeous on a DVD issued several years back (as part of a Durbin "Sweetheart Pack." ﻿ Deanna recently turned ninety, so she was twenty-four or so here. Lady On A Train was the first one where they really glammed her up (maybe too much). Off-putting blonde hair has an almost Marilyn Maxwell effect at times. Beauty standards being different then (was it the war? ), there's an occassionally lacquered look to the make-up. 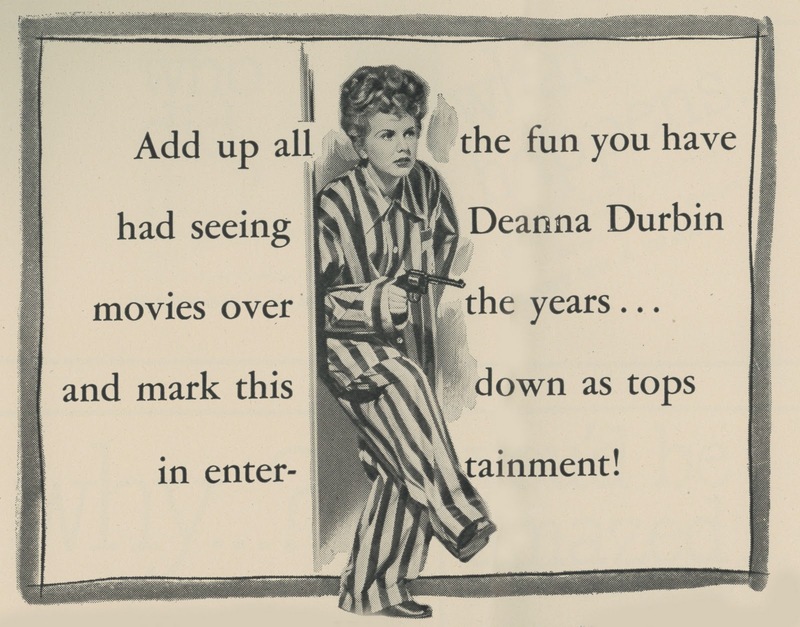 Uni in the mid-forties was for maturing Durbin while maintaining what worked from her adolescent past. The strategy made for much tightrope walking with DD's fan force, still an army to be reckoned with. Christmas Holiday of the year before was a one-off that maybe should have been a never-was (her legions didn't like it and the title was fatally inappropo). 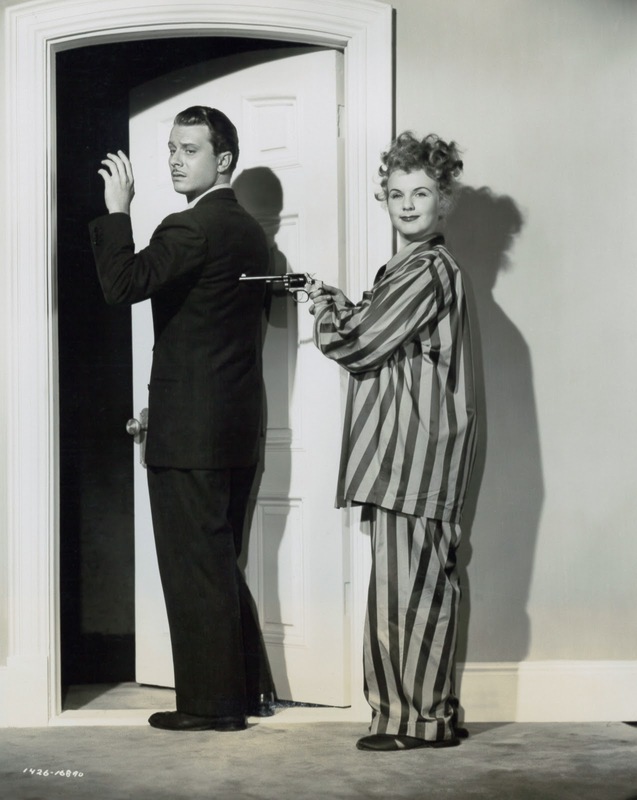 Part of Holiday's problem may have been getting in ahead of noir conventions not yet firmed. Patrons, most of all those for Deanna Durbin, were unprepared for such onslaught in a 1944 just being introduced to darkish themes. One contribution the no-expense-spared Durbins made was lush sets left over for lower-cost brethren to later occupy. I kept figuring Lionel Atwill or Rondo Hatton to peek out from behind one of Lady On A Train's plush curtains. All of Universal seems like home once you've sat for its "Shock" package, and much of a coming generation would. Splurges like for Durbin were the anomalies there. (Comparative) cheapies such as horrors, Sherlock Holmes, and so forth were benign scavengers upon plates left by Deanna and unaccustomed "A" guests at U's table. In fact, Lady On A Train has much old house and creepy appeal, enough to vault past spookiest of straight chillers, thanks to greater $ spent and effort applied. The set-up of Deanna observing a murder from inside a passing train happens within an opening minute, assuring reasonable pace from there. Mysteries work better on me as age presses (they didn't used to), even when the killer's identity is clear for the same actor having 'dunit so frequently in the past. A huge help too is Miklos Rozsa's moody score. It's not tricked for comedy or Mickey Mouse-ing effect. You could as easily graft this music onto Double Indemnity and come away satisfied. Deanna doesn't sing until forty minutes in. A few night-club background-ed tunes follow. One of them is Night And Day, among H'wood moments where you could accurately say a camera caresses its subject. Some of the comedy is silly, if not foolish, the kind you'd need two thousand folks crowded in a theatre to make work. Again there is clash between ingénue Durbin and sexier persona developed by the actress as she grew. DD really sold allure where she could, obviously in hope of putting to bed a Miss Fix-it she deplored. 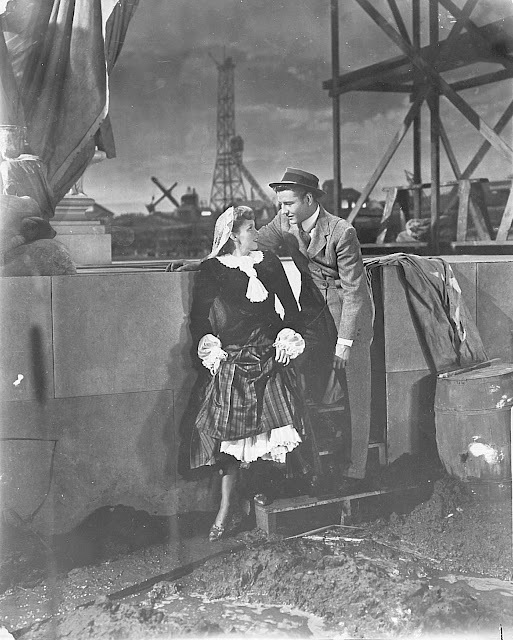 I'd guess without knowing that Lady On A Train was (is) one of her favorites, for glamour treatment it afforded if not husband-to-be Charles David in the director's chair. 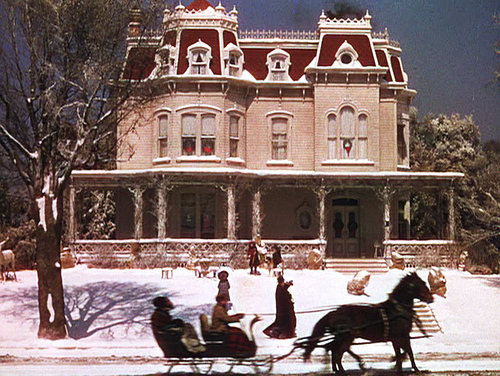 Finally among good things is Lady On A Train's Christmas setting. 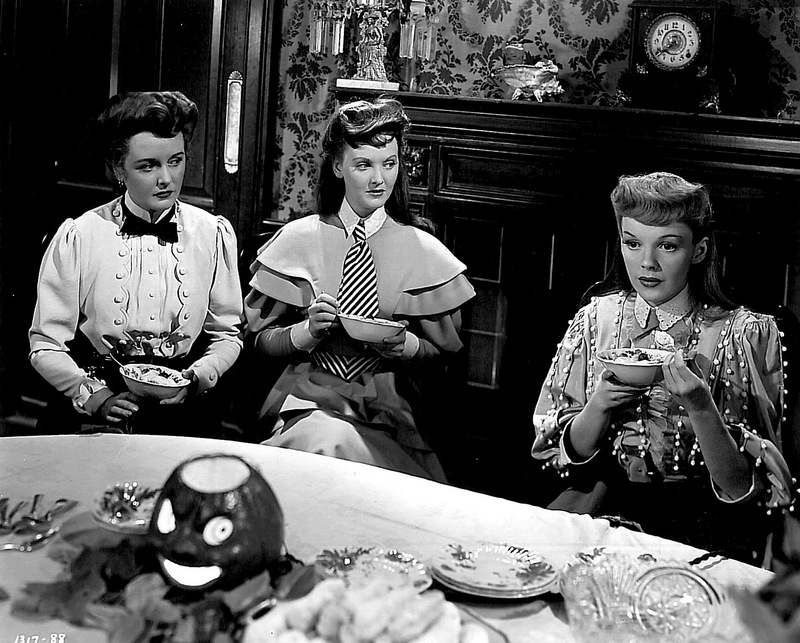 It makes a swell combo with MGM's Lady In The Lake, another that combines Yule cheer with murder investigating. Whether stories work in these is less vital than irresistible 40's modern-dress backdrops --- offices, night spots, trains, apartments, all so much classier and appealing than stripped-down remnants of gracious living 2011's stuck with. Such shows are a lifestyle tour of gone times and so much more vivid now that we're in digital receipt of them. Lady/Train/Lake are crisp enough on DVD to step into, and highly recommended for run-up to the holiday. My greatest pleasure in St. Louis' Halloween section has always been the Braukoffs, having grown up in a neighborhood with latter-day counterparts in abundance. 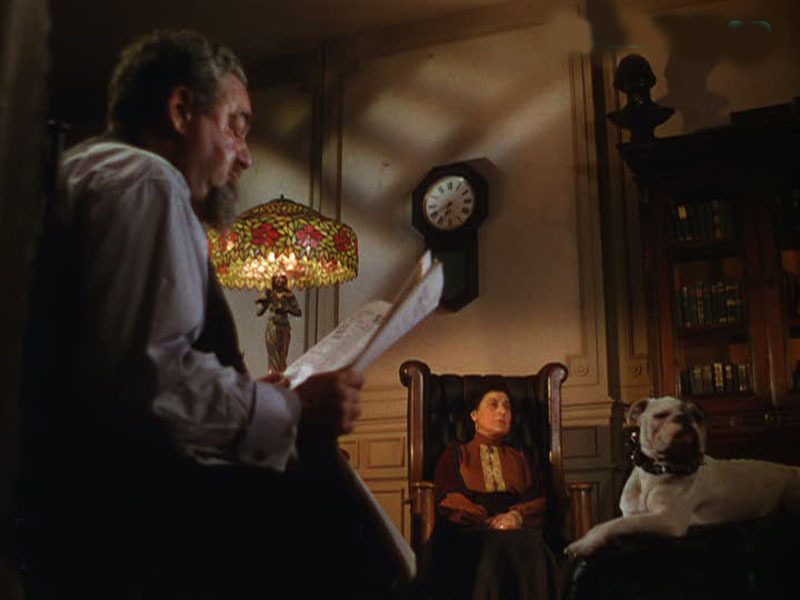 An all-time fave-for-me shot is Tootie’s first glimpse through their window (seated Mrs. Braukoff is a particularly frightful image). I grew up near several houses as forbidding and might readily have imagined certain of my neighbors with boxes of dead cats. The Braukoffs seem less sinister than people who just want to be left alone. Ann and I talked a lot about them after watching Meet Me In St. Louis. She felt they were more sinned against than sinning, and might have been more sociable had the community not ostracized them so. As it is, we get the impression that the Braukoffs have run out of patience with Kensington Avenue youth well before Tootie comes knocking at their door. In view of the couple's standing among neighbors, it probably comes as no surprise to Mr. Braukoff that she would throw flour in his face. For characters that appear so fleetingly, I’ve expended more thought on the Braukoffs than anyone else in Meet Me In St. Louis, maybe just for having encountered so many ominous (and maybe misunderstood?) figures like them. Halloween concludes with a nicely disturbing segment wherein Tootie accuses John Truett of tearing open her lip. 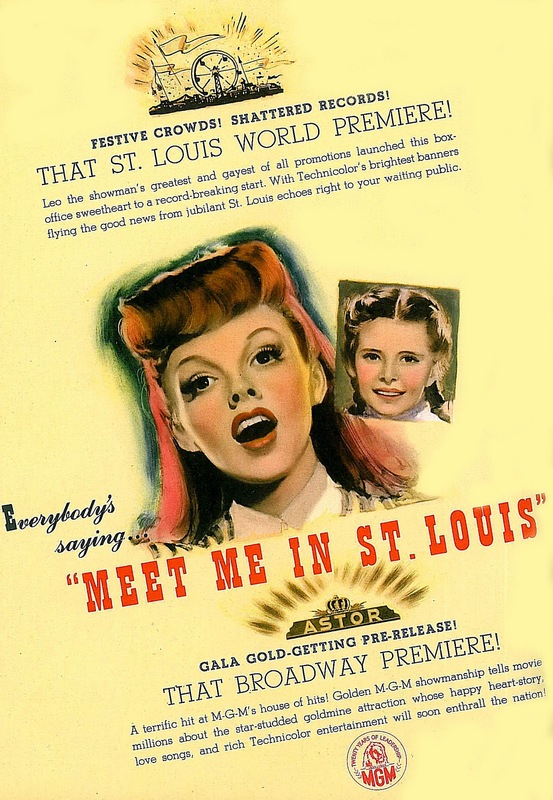 Meet Me In St. Louis at this point seems to be spiraling toward dark direction as the child recounts what sounds like a molestation by a boy next door we’re still not quite sure about (after all, he’s made no move to kiss Esther, despite her invitation). John’s exoneration is slow in coming. We spend nearly a reel imagining the worst. 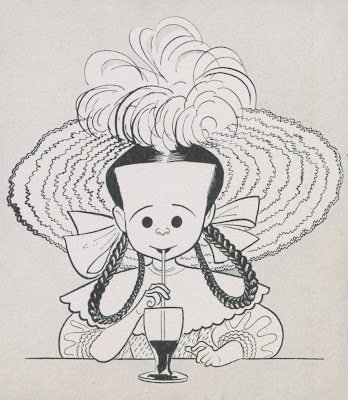 For having caused the mess, Tootie becomes herself a reasonable candidate for intervention. Such hysterical behavior and subsequent tearful business as knocking down snow people would today be addressed by way of Lithium or Zoloft regimen, putting paid to talk of doll cemeteries and rivers filled with dead bodies. Result: a twenty-first century Tootie neatly lobotomized and no further cause for family alarm. I’m still not past this business of Rose dating her brother to the Christmas dance. The way it’s set up is distinctly creep-inducing. Did these actors realize their characters were siblings? Henry H. Daniels plays Lon. 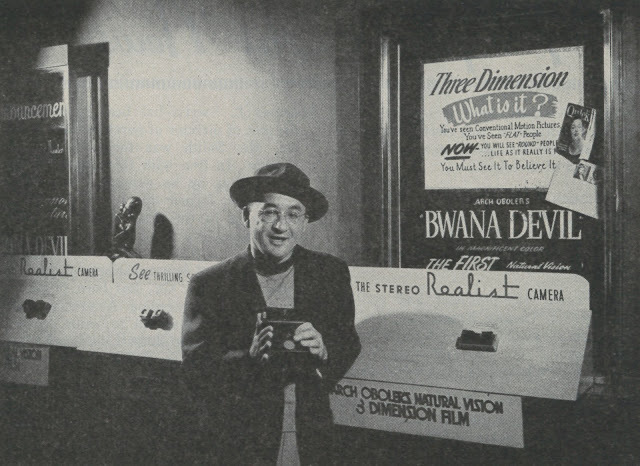 This was his first film. There wouldn’t be many more, and few of those saw him credited. Daniel’s line readings are weirdly fey. When he’s finally persuaded to ask his sister to the prom, they both play it way too boy-girl for comfort. It’s always fun watching first-time viewers squirm a little during all this. 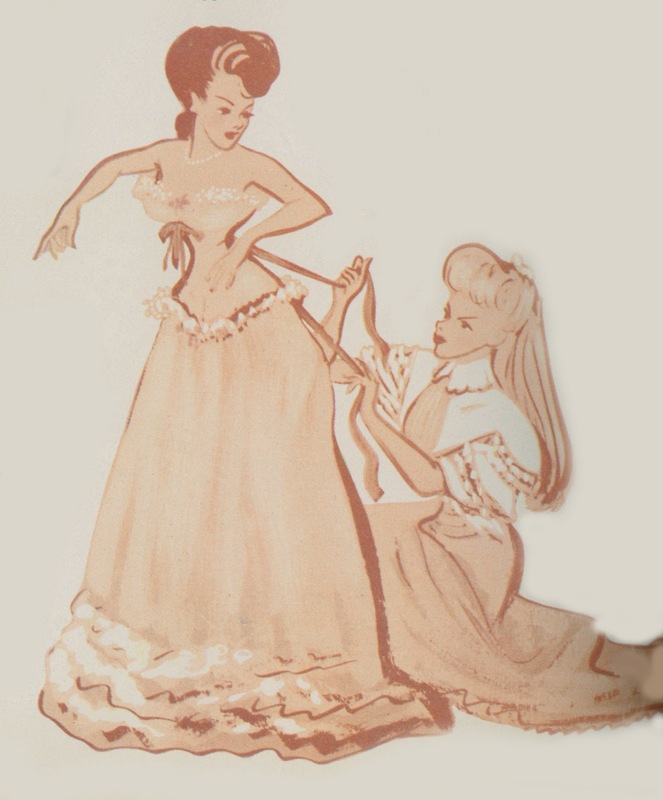 Then there’s the added fill-up of Esther being fitted for her corset in the next scene. Turn off the picture and just listen to the sound next time. It’s as close as you’ll get to a moment of Judy ecstasy beyond what she conveyed singing on stage and screen. Why couldn’t John simply borrow Grandpa’s tuxedo? That would have been too cruel, I know, but the thought always occurs to me. As it is, the old man has the number of every geek and social outcast in St. Louis. 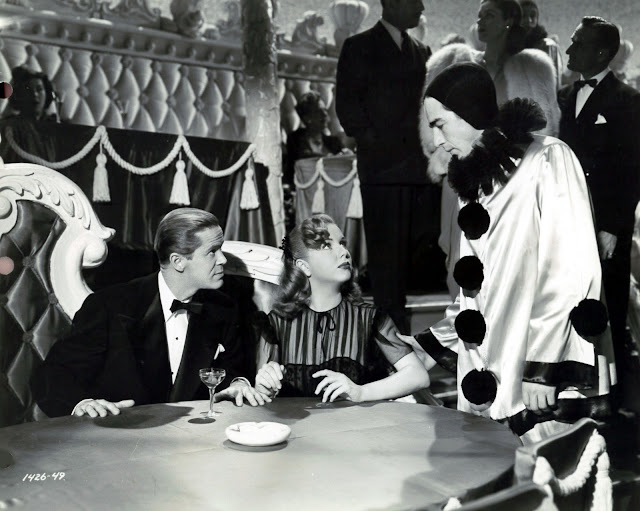 Clinton Badger, Hugo Borvis, Sydney Gorcey. Everyone’s a perfect horror, says Rose (another reason I find her largely unsympathetic). Actually, there are several Clinton Badgers in Meet Me In St. Louis. 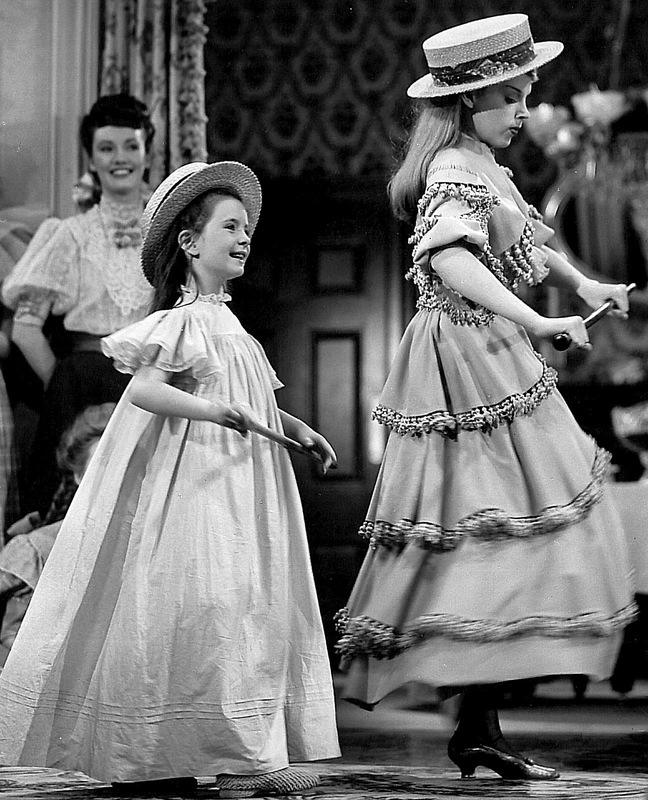 Some wear glasses and all are adjudged not good enough to dance with the Smith girls (one is unbilled Our Gang alumna Joe Cobb). Esther rigs nemesis Lucille Ballard’s dance card so that she’ll be stuck with the three pariahs. There’s a shot of them looking on with approval, from vantage point of the wallflower’s section, as Esther waltzes off happily with late-arriving John Truett. A follow-up to Meet Me In St. Louis might profitably have explored the lives of Clinton, Hugo, and Sydney, as I’ve no doubt many audience members would have more readily identified with them. 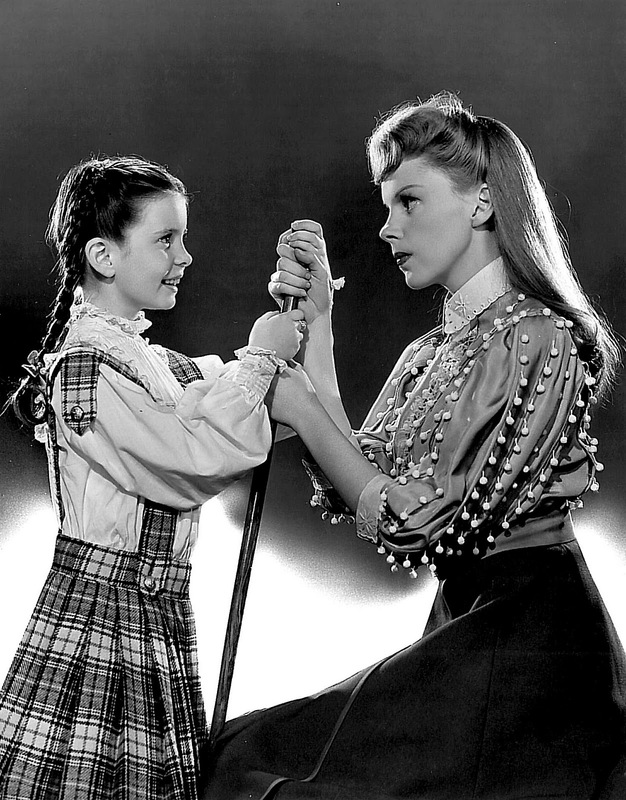 Have Yourself A Merry Little Christmas as sung by Judy makes me a little weepy even when I hear it in the car. As lead-up to the big emotional meltdown and cathartic finish of Meet Me In St. Louis, this is the song remembered best from the film. That it’s become a Yule standard helps too. Part of my enduring sentiment for MMISL comes of having lucked into a brand new 16mm print in late autumn of 1976. 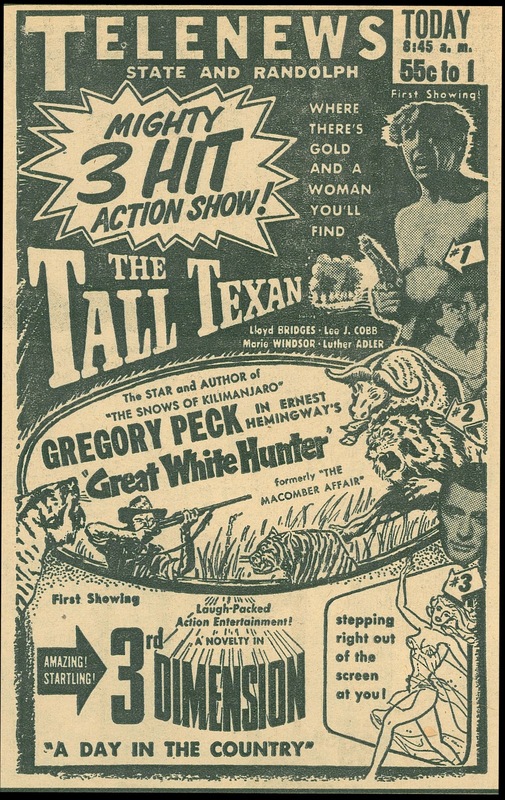 To own such a blockbuster was as intoxicating as Christmas morning itself, especially as we scarcely had St. Louis on the syndicated tube around here. There was a space heater I ran while projecting it that glowed fireplace red. 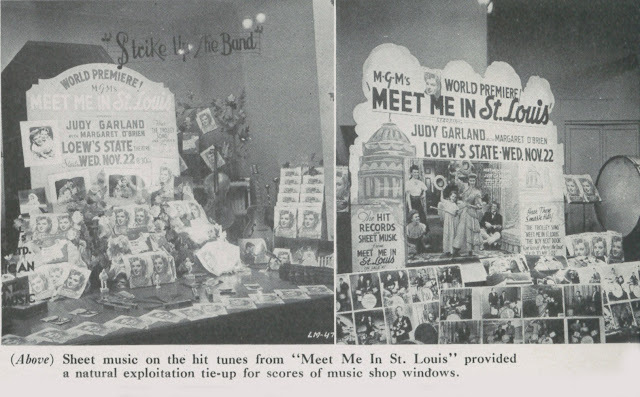 Having Meet Me In St. Louis around the house enhanced a lot of Christmases. If there was ever justification for collecting film in those days, this one supplied it. Warners' new Blu-Ray looks better than most any print, but there’s no duplicating the exhilaration of threading up a rarity seemingly unavailable to anyone else at the time. 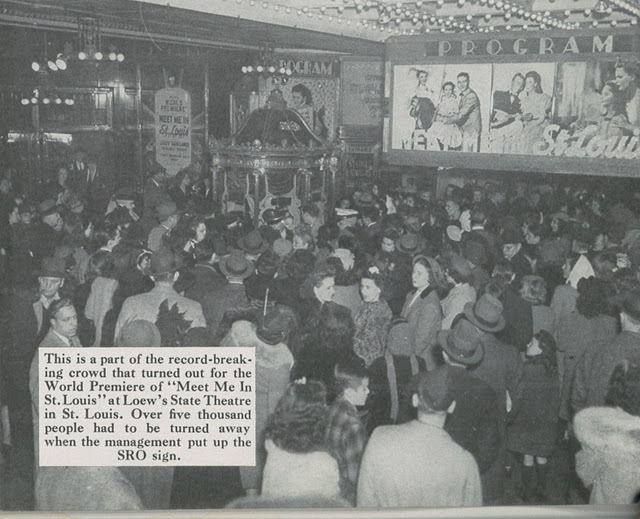 I wonder if CBS ever considered leasing St. Louis for possible Christmas runs after their 1956 success with The Wizard Of Oz. Trade press at the time doubted any oldie could do perennial duty like Oz. Nothing else was in its class, they said. 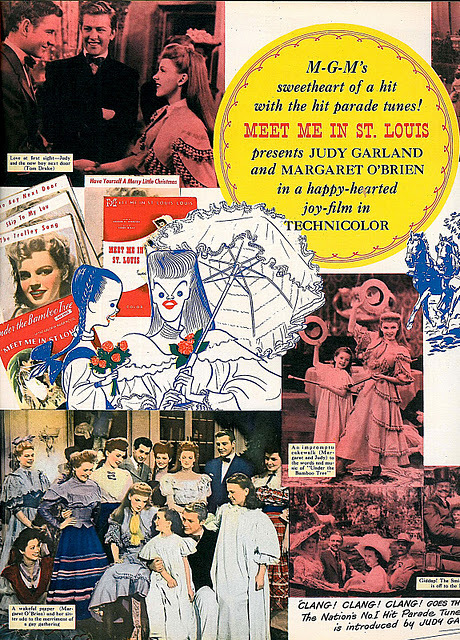 Still, there might be evergreen status to this day for Meet Me In St. Louis had one of the networks elected to play it yearly for the holidays. MGM's St. Louis street would serve as backlot shrine and setting for nostalgic themes explored by filmmakers to come. 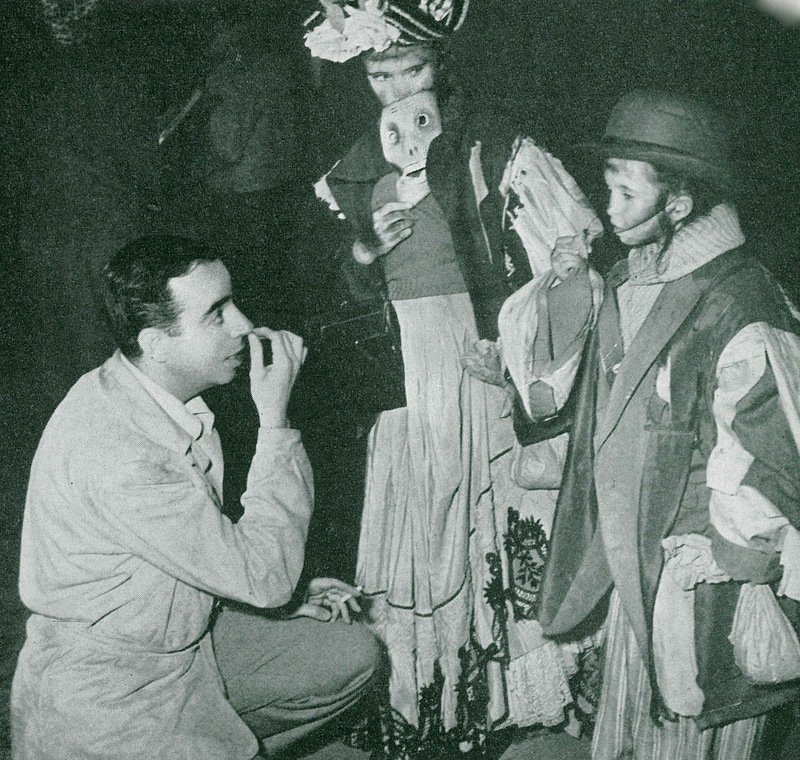 One of them was Rod Serling, who walked down Kensington and saw visions of his own Binghamton, NY upbringing. How many others responded similarly? 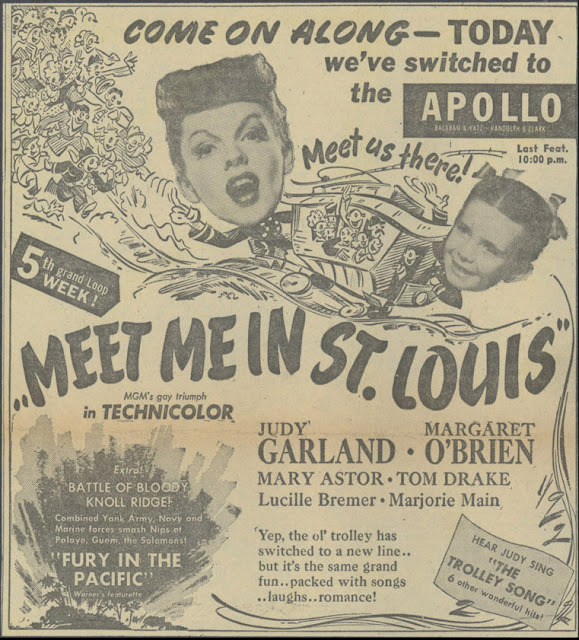 Serling would translate his sentiment to a Twilight Zone episode called Walking Distance, wherein ad exec Gig Young reclaims simplicity of youth via time travel back to "Homewood," which could stand in for nearly anyplace one was raised during the first half of the 20th Century, being perhaps best represented by familiar street and sets that bred Meet Me In St. Louis (Young's character points out John Truett's MMISL house as the one he grew up in). The culture has changed enough by 2011 for that to no longer be the case, but for many Twilight Zone viewers in 1959 at least, there was, in those St. Louis false-fronts, cherished link back to lives of their own. I hesitate calling Meet Me In St. Louis my favorite picture of all time, but then I can’t really think of one that's better. 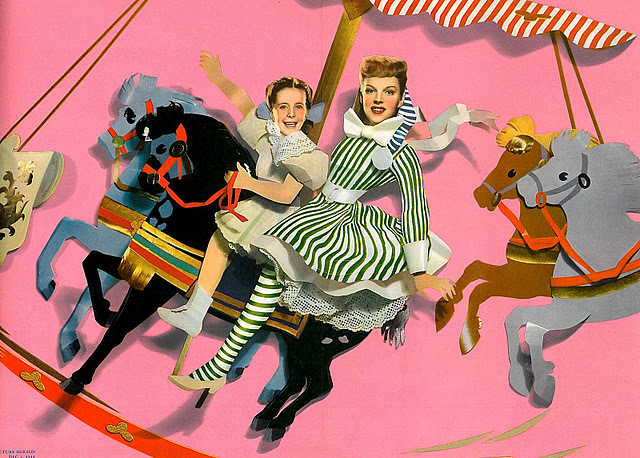 Among a wider public, it’s lacked the enduring appeal of The Wizard Of Oz. 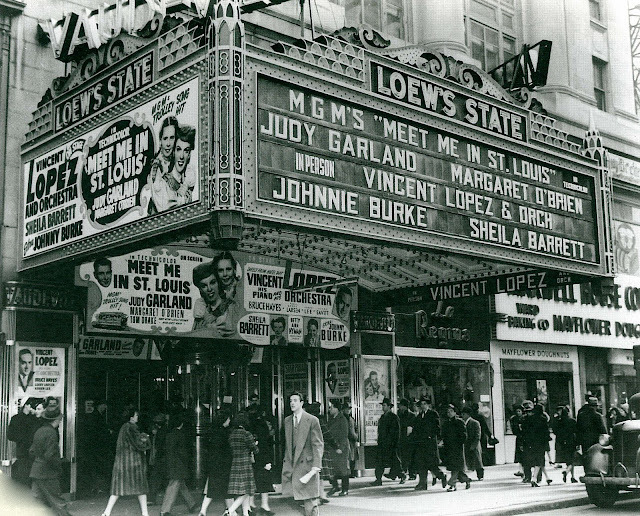 When I rented St. Louis from Films Inc. for a 1975 campus run, we had barely a row filled. Students were indifferent and townies who'd remember numbered few. We saw this in the forties, said a couple who seemed impossibly old to twenty-one year old me. They’d have been about the age I am now. 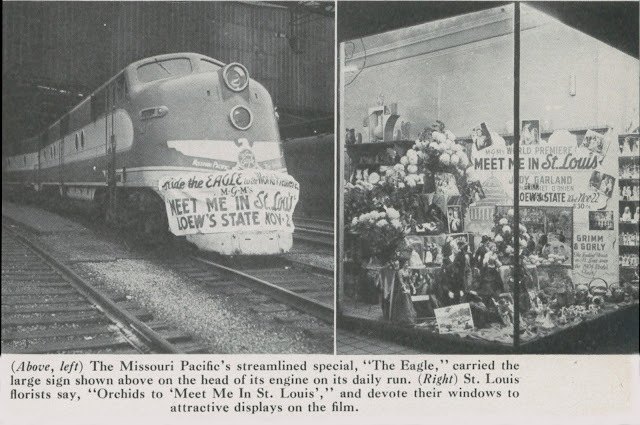 Many who caught it new lived the era in which Meet Me In St. Louis was set. 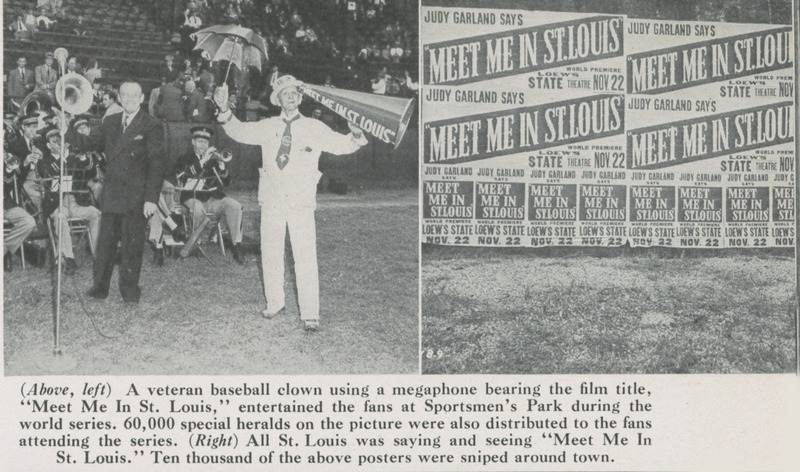 Some who attended St. Louis’ 1944 premiere would have been attendees at the 1904 World’s Fair that wraps the narrative. All that’s passed now and we’re left with a show that maybe will remind us of right here where we live, as Judy exclaims at the fade. Certainly for me its setting and incidents evoked happy past times. Lines for MMISL stretched miles past year-end '44 and into ’45. I try to watch every Christmas, being more inclined to follow this Yellow Brick Road than the one in Oz, not least for subversive aspects partly intended (or were they? ), plus as many more revealed for passage of time and much-changed attitudes since. 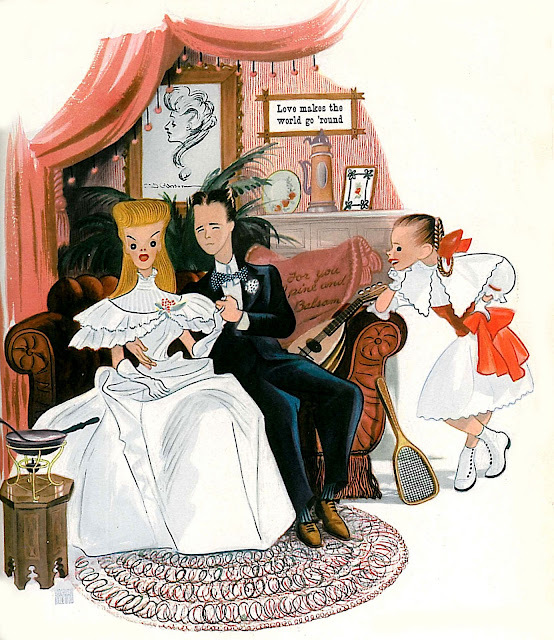 The Smiths are a happy singing family enriched by peculiar shadings thought up by artists who did not necessarily come of so functional a background themselves, here striving to portray idyllic home life they imagined others to have had. 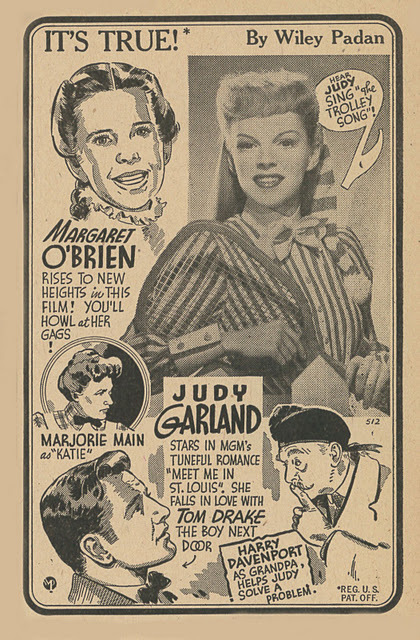 From an upstairs window, we see Judy Garland (as Esther) enter. She alights from a horse cart parked on a dirt street, but her clothes are pristine. That contrast made me wonder how anyone at the turn of the century (and before) kept his or her attire clean for even fifteen minutes after leaving the house. 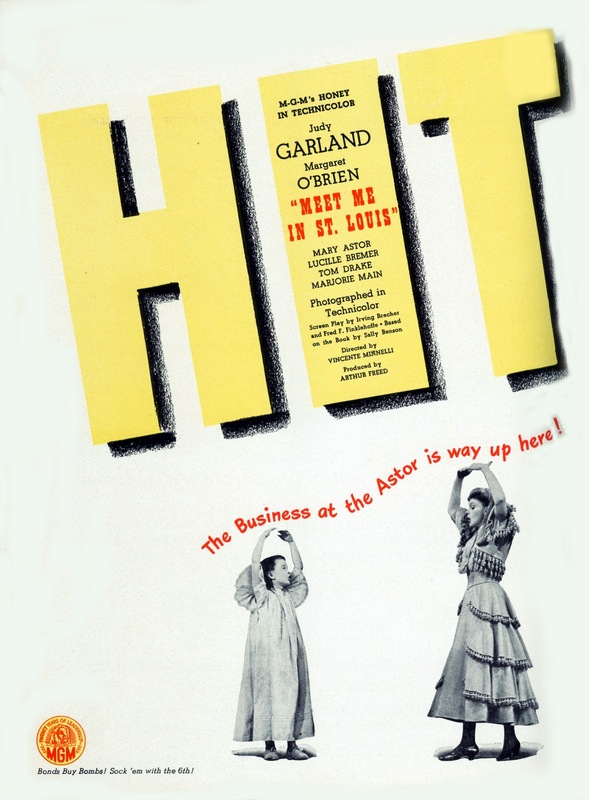 Plus she tells mother Mary Astor how hot it was on the tennis court. I’d marvel over anyone engaging exercise in so many layers of dress. Plain to see I’ve lived in this movie a long time. 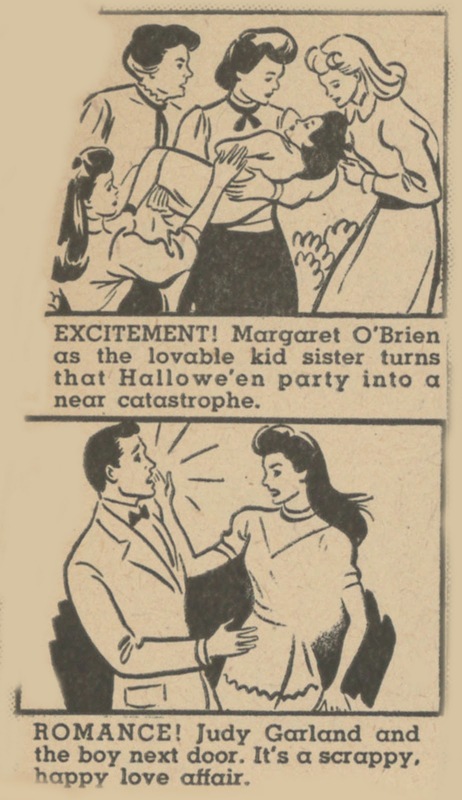 Wonder if Margaret O’Brien got that impression the time we met at an autograph show back in the nineties. I was thrilled talking to Tootie at last. 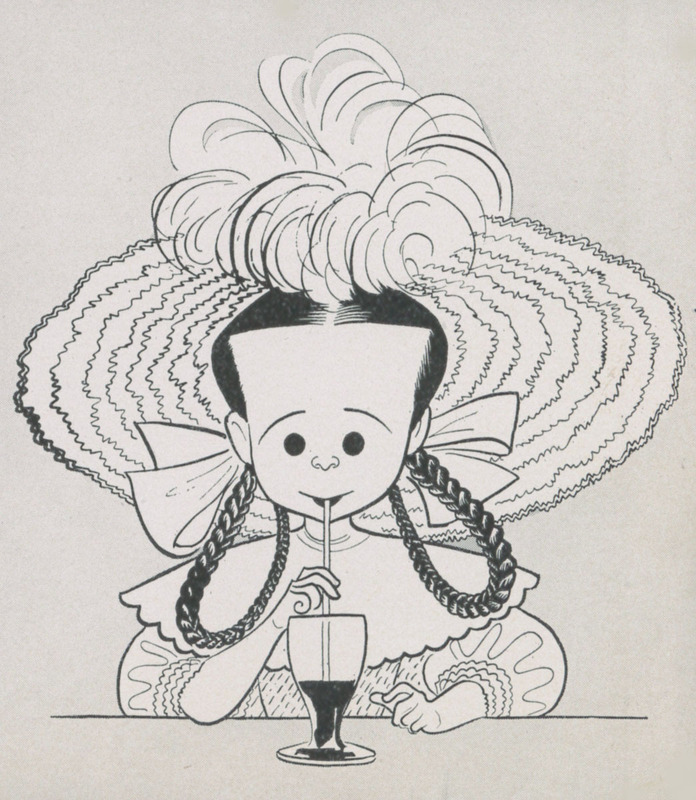 Unlike a lot of after-the-fact whining child stars, she really liked being an actress. 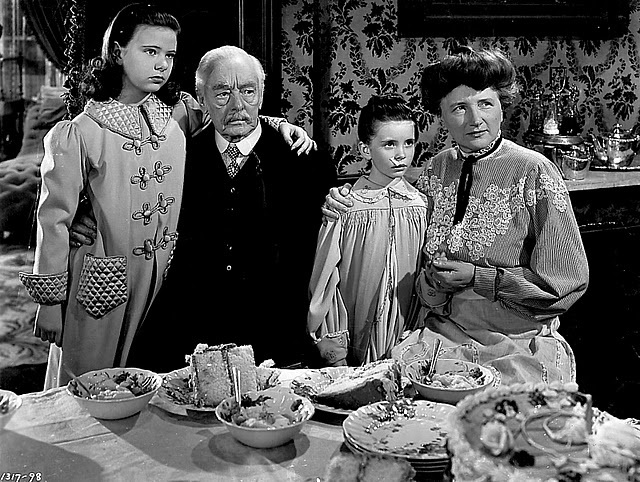 John Truett is the neighbor as played by MGM beginner Tom Drake. Character and actor are tentative, Drake no doubt intimidated by high-powered talent he’s working alongside. Miss Esther, there are mice in the house. Two-of-them. How he over-enunciates that last part might be a dialogue director’s handiwork, or a young actor’s anxiety to recite it plainly. Either way, we flinch. Drake was said (in later years) to have spelled out his one-time employer’s name with as much deliberation: When I was working at Met-ro-Gold-wyn-Mayer. Never just MGM. By then, memories of association with that fabled place were about all he had left. My Girl's Seated On The Right, But Who Was She? The house party scene (aka Lon’s Going Away Party) about twenty minutes in gives us first opportunity to see dancers and background players that appear throughout the rest of the film. I developed sort of a crush on one of them and wondered for years who she was. Somewhat tall and dark-haired with real energy vested in a non-speaking role, this girl had a beauty not rooted in 1903 when the story took place or in 1944 when Meet Me In St. Louis was made (she’s seated on the floor lower right in the above group still). I always enjoy spotting said rare specimens. They are what I’d call The Sisterhood Of Louise Brooks, or faces that look good and never mind how long ago. Perusal of the Judy Garland Message Board provided sort of an answer to the identity of my swoon (she’s also seated beside Esther on the trolley, dressed in blue). 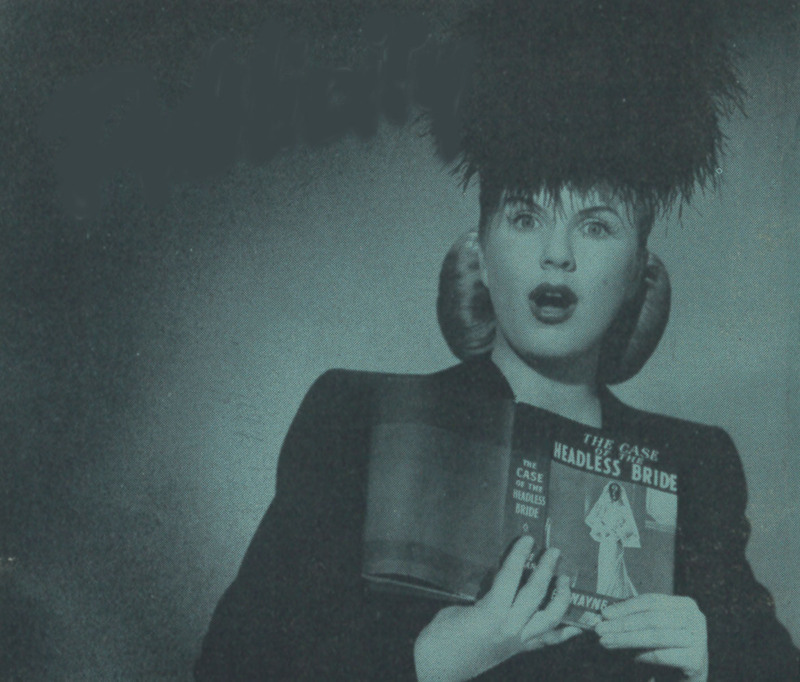 According to experts at JGMB, her name was Dorothy Gilmore Raye … but wait… others say the lady was Dorothy Tuttle Nitch. Both were dancers and occasional bit players in MGM musicals. Neither got screen credit, so it’s difficult confirming parts other than by facial recognition. Trouble is knowing for sure which is who. Dedicated St. Louis fans parse these matters on varied forums and I’m awed by their attention to such detail. 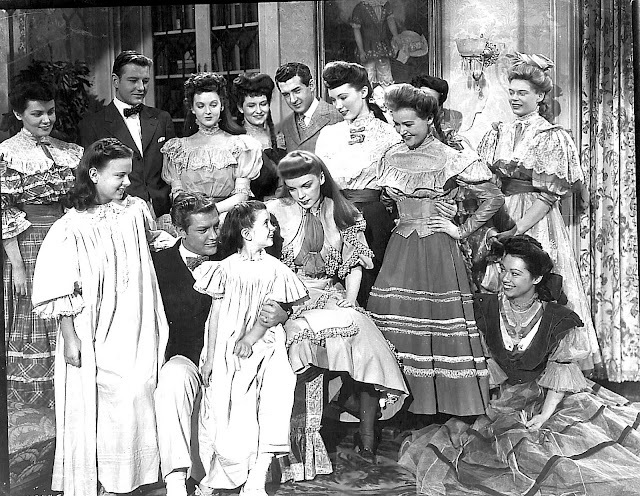 It’s interesting to observe young women surrounding Judy Garland and imagine all of them wishing they could be Judy Garland. Did such hopefuls also recognize considerable advantage of being able to go home to reasonably normal lives while she could not? I wrote previously about the time we visited Suzanne Kaaren. She was the 30’s/40’s starlet who worked variously with Bela Lugosi and The Three Stooges, plus B westerns and odd castings elsewhere. Kaaren also danced in Metro musicals and was among background faces in Meet Me In St. Louis. 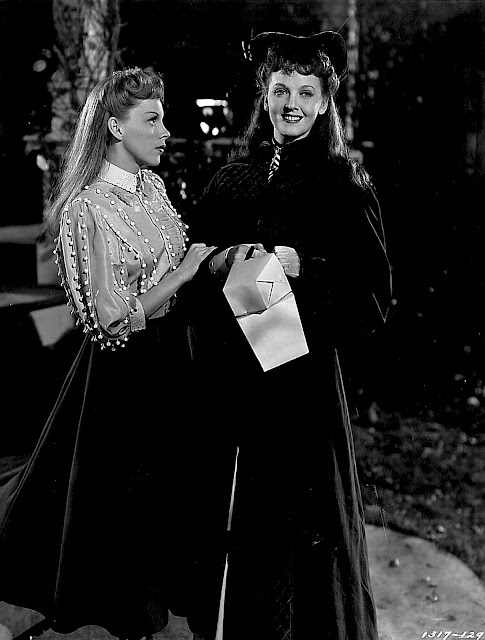 Suzanne claimed she was considered for the part of Rose Smith, but that Lucille Bremer got it for being friendly to Arthur Freed. The very mention of Lucille prompted dismissive sneers from Suzanne Kaaren. She probably wasn’t alone for objecting to rivals who got casting legs up (or spread) to secure cooperation from producers. 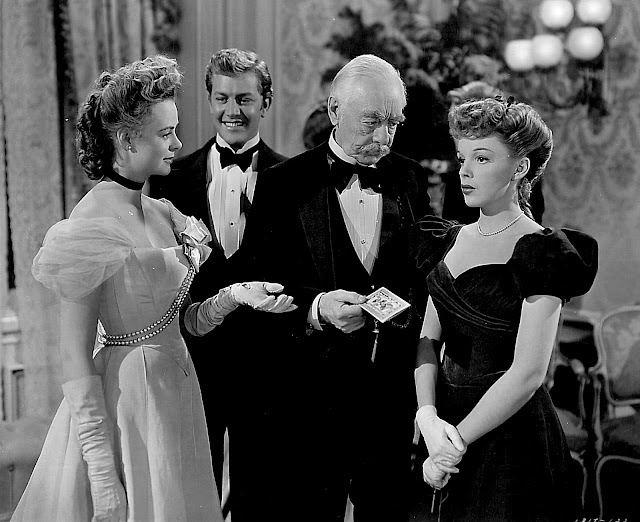 Bremer comes across less appealing in part because her St. Louis character is a little cold and manipulative. Was Lucille maybe playing herself? The reaction her name got from Suzanne so many years later furnished a glimpse into hardball politics ambitious players engaged (still do, of course). How much less do we dislike someone for having done us a perceived wrong forty years ago as opposed to just yesterday? Short Skirts on Not-So-Period Outfits ... 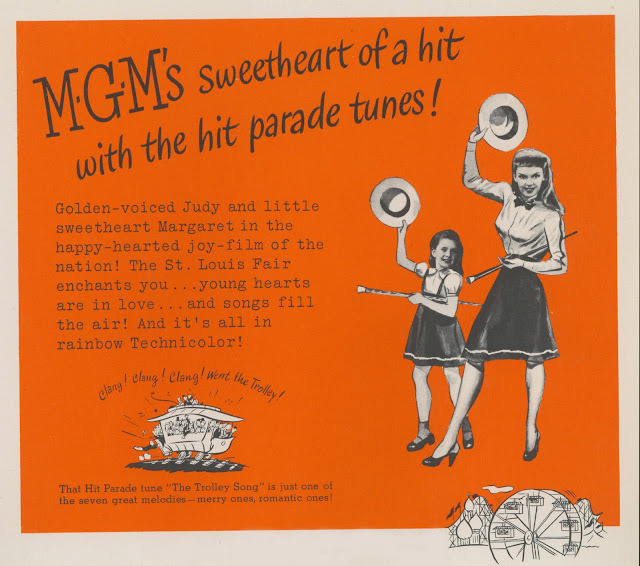 Were MGM Ad Artists Trying To Conceal St.Louis' Early Century Setting? Meet Me In St. Louis paints what seems a vivid and accurate picture of turn-of-the-century life we never knew (unlike many who saw it in '44-45 and did remember 1903). Guests bring instruments to Lon’s going away party. How else would they have had music? It’s hard to imagine households without even a radio. 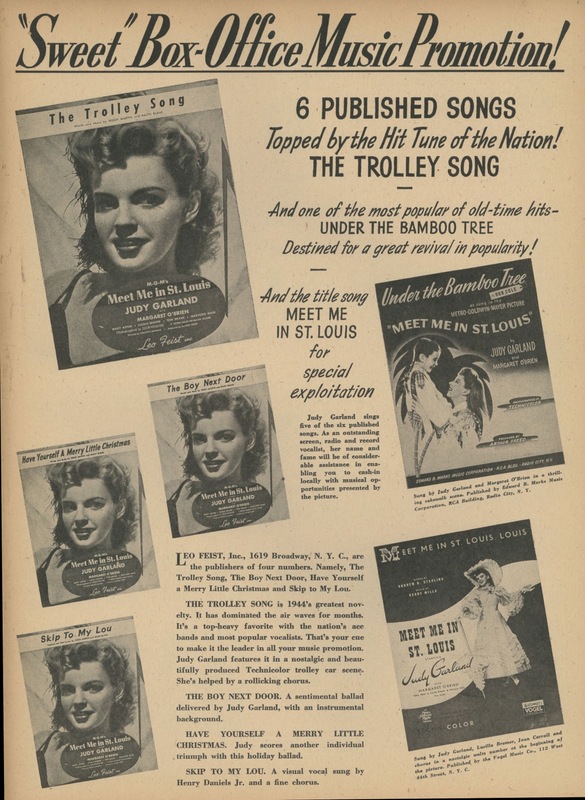 Parents of that era encouraged and sometimes insisted their children learn to play something, be it piano, violin, or washboard. My father was raised near around this time (b. 1907) and packed an unwilling me off to keyboard lessons during fourth and much of fifth grade. That ordeal ended in disaster of a public recital townfolk still chortle over. Sixth grade efforts at mastering the clarinet under the baton of former Our Gang member Priscilla Lyon ended with my dismissal from the band. How common was musical talent among 1903 youth? It would have assured your welcome at parties if nothing else. I should think those who played instruments well would have been most popular among peer groups. It’s a shame recorded music came along to erase such a talent advantage. Maybe without a phonograph’s prop, I’d have applied myself more to piano/clarinet, and been the hit at some latter-day equivalent of Lon’s party. I finally looked up the Welsh Rabbit John Truett calls "ginger peachy." It was (is?) cheese melted with ale or beer and served over toast. Has anyone out there ever served such a thing? Welsh Rabbit may have been considered a retro dish even in 1944. Maybe it’s a delicacy I’m just too provincial to have heard of. Then there is the "cakewalk." Esther and Tootie perform one at the party. Turns out a cakewalk can be many things, being defined as a strutting dance based on a march, and not confined to a particular type of music. The cake refers to a prize that winners received and ate after a competition. 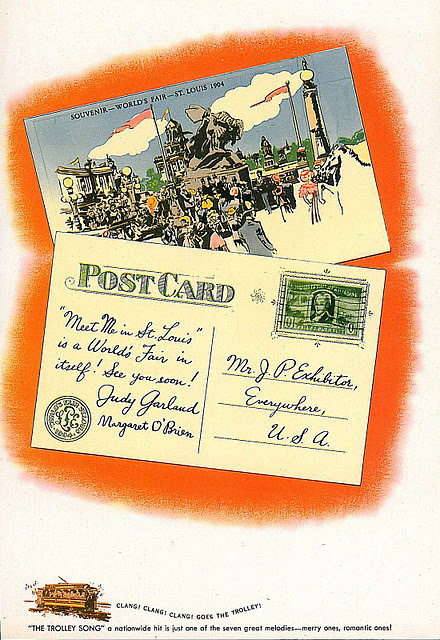 Meet Me In St. Louis revolves around anticipation of the 1904 World’s Fair coming to “Skinker’s Swamp,” which was an actual place. 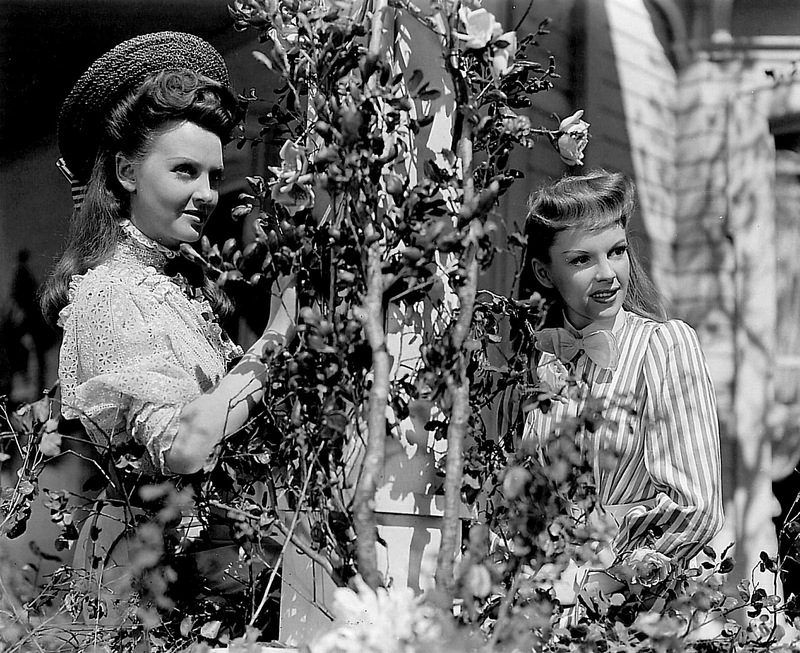 There was a major sequence taking place there with Garland and Tom Drake, including a song, which was cut before release. I’ve posted here one of very few stills I’ve been able to locate from that.